Note - Kojagari Lakshmi Puja in Bengal and Eastern Parts of India is on October 24. The term Kojagiri is the corrupt form of 'Kojagarti' - which means who is awake. 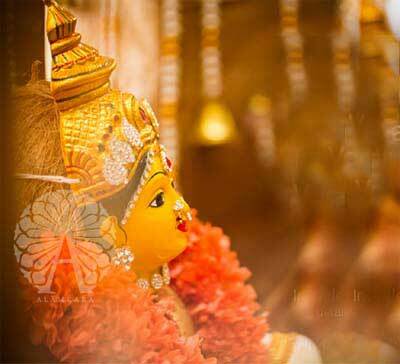 Today, Kojagari means ‘staying awake’ and there is a popular belief that Goddess Lakshmi visits homes to look who is awake - She calls out 'who is awake' - and showers her blessings on those who are keeping vigil on the night. Therefore people sing prayers, bhajans, songs and read scriptures to stay awake. A unique fast is kept on the day by many people. They only drink milk and coconut water on the day. Dry fruits like cashew nut, pista, badam, anjeer etc are mixed in the milk and taken. This mixture is known as Kojagiri milk masala. It is also the first full moon after the rainy season. Therefore people in large numbers come out to have a glimpse of the moon. Moon is the closest to earth on the day and people take advantage of the curative properties of the rays of the moon. The day is also of great importance in Bengal, Orissa, Jharkhand and other parts of eastern India. Special pujas and worship are offered to Goddess Lakshmi on the day. The day is also known as Kaumudi referring to the rays of the moon.